The federal government hasn't yet delivered a plan for reducing the country's overall emissions of greenhouse gases, but the Liberals are already supporting a more ambitious climate agenda at the Paris conference. Opposition critics reacted with scorn Monday to word that Catherine McKenna, the Liberal minister of environment and climate change, has endorsed a global goal of keeping rising average temperatures to within 1.5 degrees C of pre-industrial levels, rather than the 2 C threshold that's been the working target promoted by the scientific community for years. 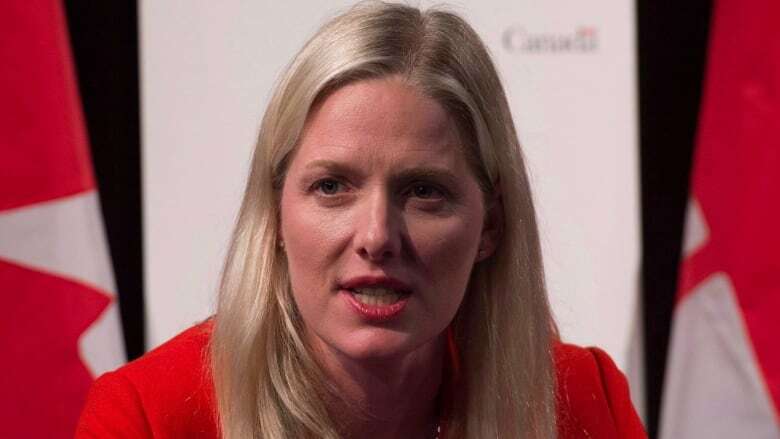 At a closed plenary session on the weekend at the COP21 climate negotiations, McKenna was quoted saying that on "the question for framing the temperature goal, we support reference to striving for 1.5 as other countries have said." In the partial transcript provided by her office to The Canadian Press, McKenna goes on to say: "If we want to achieve this temperature goal, everyone needs to be part of this. We need maximum participation where everyone puts their best efforts forward." McKenna, who has been named a facilitator at the conference, was not available for an interview Monday. "The agreement should provide a collective vision to keep global temperature increases to below 2 C, at the very least," her spokeswoman, Caitlin Workman, said in an email. "We support the Paris agreement having language that says we should aim and strive towards limiting global warming to 1.5 degrees." The current emission cut pledges put forward by more than 180 countries at COP21 — assuming they're all completely honoured — are still projected to allow the planet to warm by at least 2.7 degrees C. That's an improvement on the 3.6-degree increase that is projected without the latest promised cuts to greenhouse gases. Canada arrived at the Paris talks carrying the previous Conservative government's pledge to cut emissions 30 per cent below 2005 levels by 2030 — a pledge environmental groups said was too weak but one that, nonetheless, came without a road map for achievement. Ed Fast, the Conservative environment critic, called McKenna's 1.5-degree ambition "symptomatic" of previous Liberal climate negotiations. "The Liberal history is one of over-promising and under-delivering," Fast said in an interview. "If in fact it's true that Minister McKenna is actually now looking to increase the global ambition, and Canada's ambition, her ability to actually deliver real results on reducing greenhouse gas emissions is going to be made that much more difficult and it will cost Canadian taxpayers dearly." NDP Leader Tom Mulcair suggested the Liberals are presenting "a bit of a fig leaf to try and hide the fact that Canada went to Paris with nothing." Mulcair noted he'd asked Prime Minister Justin Trudeau in the Commons on Monday whether Canada would have lower emissions in 2016 than in 2015. "He couldn't answer because he has no plan," said the NDP leader. Even Philippe Couillard, the environmentally friendly Liberal premier of Quebec, sounded a note of caution Monday. "The target has to be in the right place so we're certain, or relatively certain, of reaching it," Couillard told a news conference in Paris after a 30-minute meeting with French President Francois Hollande. Any target must be "practicable for all countries," he said, noting the two degree threshold has been recommended as a necessity by the scientific community. Tim McMillan, president of the Canadian Association of Petroleum Producers, wouldn't criticize the 1.5-degree target but cautioned that "the discipline to put a realistic, deliberate plan in place is what we think is going to lead to success." Adam Scott of the group Environmental Defence called McKenna's ambition "really welcome." "We have to keep our eye on the long game here," Scott said in an interview from Paris. "We definitely agree the Canadian government is going to have to step up its game massively in order to meet those obligations. But we think its important to lock that level of agreement into the (Paris) agreement now."